This is the full list of the final comments people made and points that did not fit anywhere else in the survey. It should become normal practice for the needs of left-handers to be considered as part of the design process of goods, buildings, everything, from supermarket checkouts (often only for right handers) to a right-hand moulded computer mouse. I am fed up with the sniggering I get when I ask if left-handed version are available. Aching back from using right-handed desks. Adaptation is the key word. Everything from scissors to people thinking "it's so cool" that you are left-handed, you get used to it all, and it becomes normal to you. After my teacher stopped trying to make me change, I went through the rest of my school years under benign neglect. However, in my work environment, because we have so many left handed employees, we are a bit more savvy about the needs of us left handers. Although I don't approve there being no special needs for lefthanders, I do think that a left-hander has something extra, the will to easy adapt him/herself. I can learn things faster than right handed people, I turned the tables around. Although I have been out of school for over 30 years, I did find that my work would be smudged by my baby finger on my left hand. If I had to write on the chalkboard, I could write with my right hand (it was much neater) and it looked good. If I used my left hand on the chalkboard, eventually my writing would become hard to read and lower on the board. I learned to adapt to this right-handed world but still experience difficulties as an adult. Both my sons who are 25 & 21 are left-handed (their father is right-handed) and have also had to adapt but with little difficulty. Although it was 25yrs. ago since I left school and now have a r/h daughter. I would be interested in how much has changed for l/h at school if any as I still see work places set up in a r/h sense which also makes it difficult for the l/h. Always picked last at sport where handedness mattered, e.g. discus, shot put javelin, tennis and rounders and lefty are thought to be less co-ordinated and therefore not as good. My sisters still call me "lefty spaz" or "clack handed" and yet I have represented my uni and county at 3 sports. I think if teachers let kids realise there is no difference then these ideas won't continue. Always told work is too messy and smudgy! Now I'm at UNI the right handed desk chairs are a huge problem! When giving lectures the projection equipment is always on the wrong side meaning I have to keep turning away from the audience loosing essential contact. This could affect my marks. Am I dyslexic as I can't spell words in my head if someone spells the word by each letter? Apart from some ignorant people who think lefthanders were taught "wrong" in their formative years I haven't had much of a problem though I had to get used to comments like "oh, you are a leftie" from almost everyone who realises it for the first time. PS: I always do my best to make right-handers feel like they are missing something. Art - specifically, architecture classes I took in college. Had to learn to draw right to left so as not to smudge - still difficult to do. Felt incompetent. as a left handed teacher I make it my business to try to help left handers generally and show them that it is not a handicap - I'm the one that writes all the names on certificates for prizes etc so they can see good writing is not just the preserve of the right handed. however, our head is left handed and his writing is unreadable even by him! I'm thinking of starting left handed writing club for the new yr 7 next year and thought I might ask him to join us!!! As a left-handed teacher, I always check to see who is left-handed in my classes the first day. They get extra support as needed. I show them how to do some things the "lefty" way! As said earlier, in my current field of pastoral ministry, as it was in my former career of nursing, many of my peers ARE lefties! As you can see from my age, I left school a very long time ago. No help was given to left handers. In fact some people made left handers use their right one .I was lucky and allowed to use my left. Thank goodness there are people about now ( like you) to help us along. Thank You. At graduation we had to grab our diplomas with our right hand and I had the urge to grab with my left on stage in front of hundreds of people. But I concentrated hard so I did not hesitate when it was my turn. at my first primary school I felt there was no specific help, but I felt encouraged to keep writing with my left hand. Some of my friends used to be lefties (who attended a different primary school to me), but were forced to change hands. Also, in the second primary school I went to (i moved from london to cheshire) one of the teachers I had selected left handers out as being "special", but not in a nice way. Being more patronising than helpful, accusing us of being'handicapped' in a way. Saying it was alright if our hand writing was messy and untidy, because we're left-handed. At university they did not provide enough of those chairs with writing desks attached for lefties, I always had to sit twisted round, very uncomfortable in lectures. Back in the 1970's and 1980's, it was still acceptable to make fun of L-H's and when I did have to mention it, I was often made to feel as if I was creating a big deal. Back in the dark ages when I was in elementary school, there was no support for lefthanded students. In fact, as I began to write, my penmanship took on the natural left handed slant. And most of my teachers insisted that I write with a right handed slant. So rather than develop the "hook", I tucked my elbow into my ribs and turned my paper...thus sharing all my test answers with the person next to me! So once again the teachers forced me to turn my paper the "right" way. Because I was not felt to be different I have never had any problems and in fact use both hands to do a variety of things .I strongly believe that it very much depends on the early years of a child's life whether they have a left-handed "problem" or not. You will have gathered from some of my answers that I am a teacher!I can also safely say that IO have had many many children who were right-handed who had much bigger problems than the left-handed. being bilingual no practice sheet in welsh, teachers seem to have little information, we have supplied school with information we have found. Being left-handed means having to adapt to a right-handed world. I am able to use my right hand far better than most righty's can use their left. Can yo tel I am not still in school? but at college in the large university class rooms, where the desk lap tops pull up from the right in front of you, I always had to use an empty seat to my left to write on. Also, in my daughter's (not left handed) kindergarten class, the teacher didn't even know there was a difference in right handed and left handed scissors (the blade being switched) I find it extremely difficult to find left handed scissors for anything-they all say "left or right handed" but that only means the handles, not the blades! My sister ordered some fine tipped scissors from you and that is how I got onto your site! IT is great! and I definitely think the schools need education on teaching to left-handed children! Cannot think of anything in particular - other than I was always proud of my work but it always had smudges on it and that I couldn't write with those Stypens that were all the rage then. Not sure if I had been assisted whether my sewing skills would be any better ! Chairs with folding desks attached. Only had one for left handers so the left handers in class had to take it in turns to use it.The others had to use the right handed fold down desks, leaning across our body to write. Conducting musical groups left-handed confuses players and choir members. Discovering the left-handed spring book made a dramatic change for me. Sadly this discovery happened when I finally decided to go back to school as an adult. My handwriting is bad and I blame it on always having to have my writing hand in a awkward position until the middle of the page. In addition, just flipping the pages was so much easier. I apologise for any spelling mistakes in this survey, and express extreme gratitude for the LHC effort towards making the world a better place for lefties!!! During my school years my teachers were very nice. Only one tried to talk me in writing right handed. She gave up quickly. Eating in the lunch room next to right handers is almost impossible. Even though I am now a freshman in college I have problems with the little desks that fold up from the side of the chair in some lecture rooms. I have to use the one on the seat next to me and no one can sit in that seat. Everyone treats us the same as right-handers, but I believe we do need special attention. I think being left-handed has made me stronger, because I always had to cope with right-handed people telling me not to complain. But I'll always be thankful to the teacher that gave me a pencil grip. Except for the smudging I always received excellent marks in penmanship. I felt better about myself when I read that Leonardo Da Vinci wrote backwards since that is how I learned to write as well. I can't do it anymore, but it made me feel special as a child. Forcing lefties to be righties is too victorian. Perhaps my teachers should concentrate more on helping us be what we are and not what we're not. Georgia mirror write's, she can write anything backwards but she is not very good at writing forwards, I have asked the school to help me solve this but at present I am getting no help?. Given better awareness to assist younger people who are lefthanded. Big problem with knives and placement of items in kitchen for ease of reaching for left handers, appliances openings, and even light fixtures are all backwards. handwriting has been difficult and the teachers would not give me any help and only complained when it was untidy. Holly has completed this via me. We both feel that her school has not effectively taken account of her left handedness. Unfortunately this has lead to some bullying incidents. I (Hannah's mom) believe the schools should give more guidance to the young left-handers ESPECIALLY when they are first learning to write. Currently it seems that they just ignore the issue and leave the students to muddle through by themselves (often slower than other students). I actually had a teacher in my first year of school that called me a "spawn of Satan" and tried to force me to write right-handed. In my experience in school, I received more negative reactions to being left-handed than getting any support from my teachers. I always give consideration to my left handed pupils but some of the other staff seem to think it odd that I even bother. I always had to sit on the end of the tables in Cafeterias, especially ones that have the picnic style tables. Very uncomfortable and often the blunt of jokes. In public school I was not allowed to sit wear I wanted and I was miserable. The same goes for sitting in the coach section on airplanes. I always liked being left handed. It meant you were a bit different. My son is now left handed (to date anyway - he's three) and I can see it will be easier for him. People frequently comment on it! I really remember that teachers that were left handed were always really nice! At college (doing a Geography degree) lots of us were left handed!Doing this has reminded me to buy in some left handed scissors for my student teachers! i always struggled to write on the blackboard, and to this day cannot write horizontally, and tidily, on a vertical surface. I am a parent of a left-handed seven year old. When he first went to school I asked his teacher if she had any special strategies for helping left handers to learn to write or equipment such as left-handed scissors as she would have several her class. Her reply did not give me great confidence "Well it is a right handed world you know!" I was flabbergasted. Unfortunately he is still struggling with his writing, although this is compounded by the fact that we suspect he is dyslexic too- but that's another story! I am a primary school teacher and know myself how hard it is for left handers!! I make sure that I provide necessary equipment and space for those in my class but have actually been made aware of more from this survey that I could be doing for my left handed children that I never had. I am currently writing my thesis for Gonzaga University about left-handers and how they/we learn differently. I am going to be researching our Washington state standardized tests scores and finding out how left-handers do compared to right-handers. Since the two school districts that I'm looking at are very small it should be relatively easy to track down students, teachers, coaches regarding the testers handedness. I want to know how much we require our left-handers to make compensations and how this may effect their learning. We'll see! I am fortunate enough to have grown up in an environment where I did not have left handed equipment. I used what was available and as a result, I am able to adapt by using either hand. I am glad that I was not limited to using my left hand for most tasks. I am glad to see that schools are finally using the arm desks that are left handed now. It is so much easier to have your arm supported than having it dangle in mid-air trying to write across your body! I am left handed by default - having been born with 1 hand - never encountered ANY problems, my handwriting is perfect but, yes, I get a dirty hand (so what? ), I embroider, paint, knit, sculpt and do woodwork with no special left handed equipment or any problems. Incidentally, I'm now a primary school teacher and I never push children towards any particular style of writing. I am left handed, and both my sons are too. It's a joy to go to a restaurant with THEM and not have to worry about'bumping' them, like I do with my husband and just about everyone else in the world. I have always felt proud to be a lefty, and happy that my sons are too. We ALWAYS celebrate Lefty Day, even tho. we are in different cities. I am the only left hander in my grade, so when my teachers have shown us things (like how to write cursive) they just expect me to understand. It's hard. I am very proud of my hand orientation and will let nothing hold me back! I applaud all of my early elementary teachers, as they never asked me to change who I was to conform to some silly idea of what people were "supposed" to do. I can't judge the schools of today. Both of my children are already college graduates and both are right handed. I didn't have a desk that was made for someone left-handed until I was in college. I don`t know if I imagine it or not, but having left handed teachers always helped me to understand and follow the lessons better. Especially in maths, chemistry and biology, It is easier to understand their questions in tests and also my marks have improved. I would be delighted to know if anybody else has made the same experience. I don't have the most beautiful writing, and people assume it is because I'm left-handed. I'd like to know if that is a reasonable conclusion. I don't know what goes on in schools today, but in my day the teacher's were very prejudiced against left-hander's. I don't mean for my survey to sound bitter. I'm not bitter at all. I'm proud to be a leftie!! I'm just trying to relay my difficulties to you/the people that will be reading the answers, etc. I don't think most teachers notice or think about left-handers until there is a problem concerning one. Right handers are the majority and very few teachers seem to think beyond them. It isn't that they are necessarily nasty to left-handers, they just don't realise that a lot of every day tasks are made more awkward when you are a lefty in a right handed world! I don't think that teachers are really aware. My own teacher was left-handed and she didn't even know what to do about it. She didn't even know about left-handed scissors! I feel that currently in primary schools there are so many demands made on teachers such as, National Curriculum, league table positions, anti-social behaviour in class, supporting mild to severe Special Educational Needs within the class,together with a whole host of new initiatives laid down by the Government and a severe lack of adequate funding for schools generally, that it's not surprising a small group of children gets completely overlooked. They don't have a disability, they are often bright and abe children who just get on with their work and often there isn't an adult within the school who has had their experience, so it's no wonder their particular needs aren't met. For a busy harassed teacher trying to help a left-hander form their letters properly is just too time consuming and it becomes mildly irritating for them. But for the left-hander it can impact on their confidence in their writing ability and also on their general self-esteem. They want to write as well as their friends and they want their work up on the walls but just don't seem to be able to get to grips with the pen or pencil. It seems to me that there are more left-handed people around now than when I was young so hopefully a larger percentage of new teachers will also be left-handed and the problems in school that my children are experiencing will become diminished over time. I just wish that the simple measures that can easily be put in place by teachers (Paper position, pencil grip and hand position)could be taken seriously by them to help left-handed children. It seems very little to ask and would cost absolutely nothing to the school but would benefit children for life. I find that a good many lefty can work/play just as good if not better. I find that being left handed has meant that it takes my daughter longer to dress if she has buckles, zips or buttons to fasten. Her teachers have been really supportive about this though, and allow for the fact that it takes left handers longer to achieve fine motor control than right handers (so I've been told). I got yelled at for smudging my papers. I could never turn in a neat and pristine paper. I grew up in Livermore CA, and went to a private Nursery School that was very popular. In my Nursery school class there were 24 kids and 12 of us were left handed. My teacher went out and got left handed scissors for all of us. It made a big difference to be able to learn how to use the correct scissors first. I didn't see left handed scissors until I starting to sew and my mom made sure she went out and got me a really good quality sewing scissor, so I had a easily chance to learn and really enjoy. I still sew today and really enjoy it because my mom made sure I got the right start. I guess you could call me ambidextrous, cause there are many things that I can do right handed, not because I was forced to, but because it just came natural to me. There are also a lot of other things that I managed to "turn around" in my head as I learned - just like looking in a mirror in my mind, I guess. By the way, my birthday just happens to be August 12 - If only I had been born 12 hours later. I have found being a left hander makes very little difference, I can text and use a mouse with my right hand, and also use right handed devices such as scissors in my left hand with no difficulty. It seems insignificant to me whether teachers would notice whether I am left handed or not, a lot of my friends are left handed, and we all adapt to right handed techniques very easily. I had an assignment this year where we had to make a movie about any topic we wanted and I did the top 10 pet peeves of lefties. It was entitled "A lefty in a righty world"
I had terrible handwriting until I was named and shamed! Now everyone comments on how lovely my handwriting is!!! I had very little support from my teachers when issues cropped up and often felt I wasn't being taken seriously, as if my problems were trivial, and think teachers could do with being made aware of the problems left handed children face. I hate it when random people see me writing and ask "How do you write like that!?" I hope my comments have been helpful. I hated getting called names because I was left handed. People still do it now, I find it frustrating because people think my writing is weird and I'm different in some bizarre way. I have been very blessed with good teachers who helped me along even though there were no special tools available. I do comfortable handwrite now and no smudges on the paper. I have gotten no support from teachers at all. I have had to adapt to doing things right handed as when I was at school, left handedness was not really taken account of. I have only been out of college for 10 years. There are still very few left handed desks here. I have passed this on to one of my grandchildren. My twin and siblings are right handed. I sometimes found it difficult to understand why pupils did such strange things with their writing. I tried to straighten them out, but often failed and compromised with what was easiest for them (Kindergarten, Grade 1, etc.) I had an intuitive understanding of perceptual problems in left handed pupils or those who were latently left handed. Some kids could not cross the midline while drawing, and turned the page. I understood why they needed to do that where're, other teachers did not seem to. Latterly, when I taught in University, I did not find any problems at all, except the distraction of seeing me write on the board with the left hand. They got used to it. my handwriting used to be very good, in cursive (USA), but suffered dramatically when I tried to learn the Nelson method used here in Britain. Now it deteriorates very quickly, half print and half cursive. I have recently been diagnosed with Aspergers Syndrome which explains some problems I have. However most people/teachers still put everything down to being LH! I have received no support due to me being left handed from teachers, nothing is ever said. However I myself got annoyed with this treatment and approx. 2 months ago I set up a left handed campaign within my school calling for fairer treatment of lefties. I sent out questionnaires to all the lefties in years 7, 8, 9 and 10. At the moment most of the replies are in, and I am preparing to collate the data over the summer, so I can present it to the head teacher and senior staff in September and hopefully get things changed. I know that I like to read from right to left, I read anything I can that way. When I went to school you received no help dealing with being left handed. I love being left handed and every year I find out who is left handed the first day of school, then tell them I am also and that we are in a special "Left handers club". This goes a long way in increasing their self esteem. I mainly do everything with my right hand except write because I just grew up in a right-handed household and world. I noticed that in school teachers were not understanding. for my children, it depends on the teacher. I read in the newsletter about people who struggle with white boards, and fully agree - they are almost impossible to use, but are also becoming increasingly popular in lessons. I recently took the SAT's and I found it interesting that when you enter the room they ask you if you are left handed so that they provide you with a left handed desk for the SAT's which was very helpful. I remember being humiliated once when, having used the proper tilt to my paper and the "proper" hand position, I received a C on a handwriting paper. These papers were then put on display on a bulletin board for all parents to see at open house. I was absolutely humiliated when my paper was right up there with everyone else's A and B papers! I made up my mind right then and there that I would never try to force any student of mine to use the "proper" paper and hand positions, because they just don't work for everyone! I seldom got any support. And if I did I sure don't remember it .I had a better time of it in middle school and high school. Mostly because I just stopped going. I do remember a comment I over heard in the third or forth grade. One of the teachers was a real bible thumper. She let a comment slip to another teacher about the dexter/sinister thing. God and the devil etc. I took it to heart for a while, but after that I just learned to ignore that kind of stuff. I started school in 1955. I hope things have changed since then. My mother had to phone the school so that the teacher would leave me alone and stop trying to "correct" my penmanship. I taught school for many years, but these are my experiences,personally and professionally. I thing the old desks where you got in on the left side with the right side arm rest were the worst thing in school when I was young. I think feeling different and not fitting in, has hurt me... maybe socially it has hurt a bit. I think left-handers should be able to get all the supplies right hander's get. THe ambidextrous scissors really don't work!!! I think most things are accessible to left-handed kids now. We're never going to live in a perfectly balanced world because it's dominated by right-handed people. I thought it is so cool when I have a lefthanded teacher that the rest of the class would find it awkward to read of the blackboard because of the teachers positioning. I tell them that is what I go through every day in my life. I took shorthand at school (and still do this). As I come down to the end of the page I have to be ready to quickly turn over the page. As a left hander you write right up to the bottom right hand corner so you can't turn the page with your right hand, which slows you down a little. A right hander has their left hand free to turn the left hand bottom corner over. It's a problem which I've overcome, but maybe I could have achieved more than my 110 wpm if I was right handed!! I try to celebrate a left-handers day in school. (Can't use August 13 because the kids are often not in school yet.) I have many activities that are slanted towards left handers and have my right hander's try them. You would not believe how much they complain about the difficulties of some simple tasks. It really makes them aware of how much adapting us lefties have to do. I was lucky that no ever forced me to be right handed. I note that there seems to be a camaraderie between "lefties". I was never shown how to angle a paper so that I could write properly. My mother taught me. I was originally told to write with my right hand - my first teacher did not approve of left-handedness. If it wasn't for me making a point of speaking to a teacher at an opening evening I would have failed my GSCE's and my A Levels, as well as other exams, as my teachers did not do anything about the fact that I wrote slow. Academically there is nothing wrong with me, it is purely the speed in which I write, as I write quite slow. I did not do well at all in my mock GCSE's, and this was not picked up by any of my teachers and it was never associated with my speed of writing. Luckily I am allowed extra time in my exams now and have consulted the appropriate people at my university, with which I am not allowed extra time and they have taken my comments into consideration, for which I should now be allowed to take tape recorders into any further lectures, as I struggle to take notes. If tired/anxious, reverse speech syllables, so was shy at school. I'm not as left handed as my daughter, having been told to do so many things right handed so I'm more aware of her situation however even down to playing cards, she had difficulty in school as all the number KJQA etc etc are on the right hand side so if she spreads them out in her hand, she can't see them! In classrooms, although there are some desks made specifically for righties, there are none made specifically for left handers. In college particularly, the lack of left-handed desks was a real problem. I was a music major, and, as you know, more left-handers are "creative types". So many of my classes would be 25% or more lefties - if I didn't get there early enough for the 1 or 2 lefty desks (always less than the 10-15% that should have been there), I was stuck sitting sideways. In elementary school, at lunch time, we'd have these huge long tables, and every lunch period, Id sit next to some right handed kid. but I couldn't move because we all had to sit together. In high school it got better, we had round tables, much easier to eat at. In former GDR teachers tried to "turn" lefties to righties; we should only use our right hand for writing and so on and in some cases they (tried) to tie our left on our back. In high school and college there are a limited number of left-handed desks if any at all. I find it frustrating to manage to write at a right-handed desk. I have to shift my body to the right more to overcompensate, making it look like I am trying to cheat off my neighbour. In kindergarten (pre-grade school) I was forced to use my right hand at lunch to eat, and for drawing pictures. They would tell me to use my right hand. Therefore since then, I have become ambidextrous in most everything except eating and writing. My right arm is stronger than my left. I throw any ball (baseball, football, bowling ball) with my right hand. I kick a ball with my right foot because that's the way we were taught. In my 1st year at school (1976-77), I was FORCED by my teacher to sit with my LEFT hand behind my back, and to write with my RIGHT hand. In my second year of primary school, my teacher hadn't realised I was left handed and told me off for pretending I was. She simply hadn't noticed even though I'd been in her class for months! In Primary School, you adapt to your own way of handwriting and nobody tells you to do otherwise, so when you are older your handwriting is awful and smudged. The side if my hand is normally ink stained at the end of the day from dragging over my work. In the 60's, it was common practice to change handedness to right. My parents told my teachers not to change me and my teachers very supportive. In college, I had to learn to teach and play all sports right- handed as well as left. This was a challenge but was a tremendous benefit when I started teaching PE. Unfortunately, my professors did not make the right-handed students learn to play left-handed. I feel it was their loss. In year 7 I was told off by a teacher for tilting my paper. As a result I never again tilted my paper at school and my handwriting suffered as a result of this. It always made me feel different. Like I could not do anything the right way. But now that I am older it sometimes gets better by the day until I hear you left handed people are not good for anything. It has always been a problem to write without posing the elbow on a surface. There were no special desks for left handed students at school. It was very hard for my parents because I am the only one left handed. My parents, 2 brothers and sister are all right handed. My grandmother had to teach me how to write. I've also come across this problem with my children. I have to truly concentrate when showing them how to write because it is so uncomfortable for me. It's mostly the speed with which I write which has caused a problem, weather it's comments from teachers or class mates. it's not a lack of support generally, it's just that no one can be bothered. I basically just adapted, thus becoming slightly ambidextrous making me even more wonderfully special! I've been happy because hardly anyone in my class is left-handed and I like being different! Jokes made about it by peers (non-malicious). Jr. and Sr. High were terrible; you had a right sided desk and had to lean over to the right to write. Very uncomfortable. Even in college, there were a minimum of lefty desks, and then the righties wanted to use them as well and most would not relinquish the seat when asked. Lockers are more difficult to open when you are left handed. Surrounded by righties, it is touch to get left hand in to do combination - more shuffling, etc. Many teachers don't consider left-handers to have differing needs and comments such as'they will just have to learn to adapt' are still heard from right-handed teachers. keep up the good work raising the profile of left-handers- one day all schools will catch on and become left-hander friendly! Matt is v strongly left handed, left footed and left brained. School talk about supporting left handers but do v little and forget v quickly, though they do respond if Matt has confidence to ask, e.g. to move seats. Maybe in today's times they are better, but I don't think that is so. My daughter is left handed also and in school much more consideration is shown to her than ever was to me. My mum was also left handed but when she was at school she was made to write with her right hand, I was just relieved at school that I was not treated like that. More attention to allowing lefties to pick on righties would be fun. (he he) I think lefties have more fun in life too. Most of my teachers never paid any attention to my handedness and if they did they viewed it has a problem I should deal with myself, since they were right-handers they didn't understand my problems I might be having or how to help. most teachers don't treat left handers and right handers differently but class mates do notice you are left handed and sometimes think its bad to be left but its different and can be an advantage. I think teachers should teach left handers how to cope with writing, playing sports etc at a young age so we can grow up knowing it isn't wrong. I think being left handed is more special than being a normal right-hander. Multiple choice and tick boxes are always on the right which means I cover the question with my hand when trying to answer. This is difficult also when putting marks in the correct place on a grid when the axis is on the left - why can't it be duplicated on the right? This is the case in SATS tests too. My biggest trauma took place during my kindergarten years when I was learning how to write my teacher wouldn't let me use my left hand, anything I did with my left had she would not grade and she'd make me do it again, she even called my mother and told her that I had some kind of learning disability since I could not use my right hand for writing etc...there was a moment in which I seriously thought being left handed was wrong so I tried my best to be right handed but it just never worked well, when I was 8 years old I had a friend who was also left handed, that helped me understand it was not I who was wrong but my teacher. my english teacher picked on me because of my writing, she said it was scruffy, and smudged, so my mum had a word with her, my teacher told my mum she hadn't even realised I was left handed, but it hasn't stopped her moaning. My first-grade teacher, a lovely lady, was confounded by the way I drew circles (counter-clockwise as opposed to my classmates' clockwise), and that I crossed my A's, I's, T's and H's from right to left. She was very firm that I needed to do things the way the other kids did them, but that didn't feel right to me. I ended up feeling like I wasn't as good as the others, which made me strive to prove that I was actually better than they were. I guess in the end it all worked out all right. I mean, left. Ha ha. My gym teacher made me bat right handed even though my dad taught me to bat left handed. I still can't figure that one out. no support at all from the teachers, although they didn't make me write with my right, just left me to my own devices and didn't do anything to stop me turning the page. NO support. I do however have a good outlook because there are many lefty teachers and they all are very proud. I hope the schools respect the needs of all students...not just the ones they share handedness with...after all, We are much better than them. Not at school BUT at work I used a desk calculator,because I used my right hand for this, (no option the machine was weighty and Plugged in a set space on the desks)I became adept at writing the calculations as I worked them out..my right handed colleagues were fascinated!! and for once envious. Not only am I left handed, but both of my children also are left handed. I answered for all 3 of us. Nothing at all, you have asked everything you can. Nothing was ever mentioned about my left handedness. It was almost like they figured I'd outgrow it or something. My dad was the only one who tried to help me by showing me how to place my paper properly. Occasional bullying about being left-handed and being "awkward" when writing etc. Written work smudged continually, when using school pens - until my mum bought left-handed pens etc., from your company !!!!! - what a fantastic difference the things which my mum bought for me have made in my every day life !!!! Our third grade teacher once said that left handers weren't brought up right. Two school-mates, who were jerks, often would say that to me. If they did it today, I'd punch them in the mouths and tell them it was because I wasn't brought up right.. Meanwhile, hands down, I won all of the handwriting awards. Being male was a double jolt for them and the nearest runner up was a girl who was left handed also. Our year 2 teacher has supplied cushions for the left handed children to sit on, this has improved his writing. overall cognitive abilities and self worth are damaged because the world moved in an unnatural direction. people always comment that it always looks like I'm going to cut myself when using a knife or scissors, etc. Primary school trip to an activities centre - there wasn't enough left-handed archery equipment or canoe paddles for the 5 out of 18'lefties,' so we had to wait for the others to finish. Right-handed DESKS. My university stocks ONLY right-handed desks. I solve the problem usually by sitting in one, and using the table of the one next to me, but sometimes classes are too crowded or the professors don't allow it. Even a NEUTRAL desk would be better than this! Ring binders are a nightmare for left handers - you can't write to the left hand side of the page. I didn't receive any support in school! Same teacher who told me to hook my hand ridiculed my loudly for being unable to form cursive letters properly. School aside, lefties have to live in a right-hand world. It's a challenge, but also an advantage to be forced to use your non-dominant hand for so many tasks. I think lefties end up more versatile and adaptable and flexible as a result. 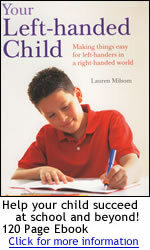 Schools and teachers need to be fully aware of the needs of left handed children. In desperation, I have now made up a pencil case for Carwyn, who will move up to the junior department in September. In his pencil case he has a left handed scissors, pencil grips, ruler and pencil sharpener. Scissors is the biggest issue. Teachers just don't know about that. screwing things in I usually do it backwards the first time. some of my teachers are left handed so they know what its like. Sometimes I felt isolated being a lefty, especially in gym class. I often didn't speak up if made to use right-handed things or play right-handed. Teachers did not like left-handed students and they tried to make us right-handed. The chairs were only for right-handed students. A lefty had to have an arm handing in the air. teachers need to notice early, and give special attention, problems will arise later in schooling. teachers never go out of their way to help me because I am left handed. my mum always has to get them to notice. Teachers should ask at the beginning of the year before working out who sits where, who is left handed so that they can position us correctly. Also when moving to middle school when we started using fountain pens no advice was given to left handers about the availability of left handed fountain pens. They should provide left handers with details of companies like yours instead of us having to discover you ourselves on the internet ! teachers thought I was stubborn because I've written "mirror images"
Teachers used to make out being left handed was unnatural and a nuisance. Thanks to all who make possible this space. I want to do my doctoral thesis about left handed and sports, so I need all the information. The best teacher that I have had is my current teacher because as he is left handed he understands any difficulties that I have had and has given my extra help with my handwriting. The biggest supporter I've ever had was my Father, he was the one who stopped them form forcing me to be right handed, he was the one who turned things round for me. I never got any kind of support from any teacher at any of my schools. The headmistress called my mum to school and told her I had to learn to write right handed because it would effect my brain if I stayed left handed! Duh!! the left handed equipments are more costly than other normal stuffs that's why my parents are not willing to purchase it, since they felt that I have no problems coping with the right handed way. The psychology department was far more understanding and accommodating than the fine arts department. I was definitely an oddity in the biology department. The school must be fair and realise that not everything can be easily used by left-handers. The teachers are all really interested and the right handers try to learn to write with their left hands so they can join our club! They have listened to my mum and have read the manual book that she gave them. They need to get more left handed desks. I have seen them in college but they didn't have any when I was in high school and grade school. This survey was probably not too applicable for my situation. Since I am a senior citizen, I was a student years ago. I grew up in a tiny town and was the first left-hander allowed to learn to write left-handed in the school - at the insistence of my parents. I had a marvelous first grade teacher who showed me how to do things correctly (position of paper, pen, etc) for a left hand instead of a right hand. Over the years, I learned to do many things right-handed simply because I couldn't get equipment to work correctly. Thank goodness, things are much better for "Lefties" these days. I remember the thrill of getting a pair of left-handed scissors as an adult. How great that would have been as a child! Thank goodness, for groups like yours who are helping left-handers to be "normal." Through the years my teachers have always been helpful to me and supportive of my left handedness. I come from a predominantly left handed family. My dad and brother are leftys, as are most of the family members on my dads side. Being a lefty is just the way it is, and it really doesn't get in the way. Universities need more lefthanded desks in classrooms. Many of the desks are just chairs with half of the desk part attached. If I have to sit in a righty desk, I have to work hunched over my paper. Very uncomfortable. used to get teased about being left-handed, today when I get asked what it is like to be left-handed I ask them to try and use something in their left hand just to see how difficult it is, and now I seem to get some understanding from others just how difficult it can be to be left-handed. Volume labels on beakers in Science are always on the wrong side for pouring. we all have our own laptops and I have the mouse buttons reversed. I always have to change them back whenever someone else wants to use it or fix it. Well in 5th grade when we took tests we had to move our stuff to the left of our desks and I was so uncomfortable. went to school in Germany over 50 years ago when writing left-handed was not permitted. When given half a picture that we have complete the other half, why do they always provide the LH half? I can't see it under my arm! Luckily my mum put her foot down about this and they now have both halves to choose from! When I was a t school, LEft handedness was not recognised at all, and I really did struggle. It wasn't until my late teens that I found out about anything left-handed and began to read up about the whole thing - I was amazed that there was'help' out there, and it really changed my life! I now can be the person I want to be without people looking down at me because I'm untidy etc. When I was at primary school my teacher tried to switch me to right-handed.And the other students bullied me because I was left-handed. When I was growing up, I was allowed to stay left-handed because I was a girl, and so was not worth bothering with to make me change to my right hand! My mother, who was born in 1912, was also left-handed, and had the exact same problems I had when I went to school years later (I was born in 1941). I don't think anything has changed with the latest generations. As long as people left me alone to do what I had to do left-handed, I had no problems. However, if I had to interact with right-handers in close proximity, it became difficult. I also ran track in school, and all of my starting blocks had to be changed to accommodate my different footedness, because all the other track runners were right-handed. I was the star of our high school basketball team, and won state-wide medals in track! Now I'm creaking with arthritis as a result! I write without being able to see what I write, and do not hook my hand like many lefties do. Now I mostly type everything on my computer. When I was in first through third grade, it was difficult for me to write up to the standard that the teachers expected. As time went on, I began to have better penmanship. As a result if my perseverance, I have better than acceptable penmanship at age 50. When I was in school my grade teacher used to slap my hand, and try to get me to switch hands till my parents went to the school and complained, when I had surgery on my left hand and had to use my right hand for writing , it was like chicken scratch, but the teachers would not help. though they would for a right handed person. who's right hand was in a cast. When I was younger I was bullying because I was different from everyone else. Now am proud to be different! When I went to school we used exercise books and I found it difficult holding the pages back while I wrote. By the time I got to college we used ring binders which again were difficult to use and put paper in. Once the paper was put in the folder it would be difficult to write near the actual rings. When I went to school, no one really cared about left handed students and it was never even talked about. I did not see left handed desks until I was in college. Sad really, I think. When I when to a club meeting at college to see if I wanted to join. I was greatly offended when I learned that I was going to have to sign with my right hand. The club signed to songs. I was in a club like this is high school and they did not care. I would only have to switch sometimes when it was more obvious or looked funny. But this was only one sign at a time and they asked me if it was ok, so I did not mind. Also, I like right handed paddle desks. I know a lot of people don't, but I found it uncomfortable. I don't know if it was because I was use to right handed desks or not. But I liked how you could lean your right hand on the desk and still write. the table to the left.So we have to be very early at school to get the lefty one ,or had to spend the whole afternoon "twisted" to the left. With the exception of my first grade teacher, subsequent teachers were ambivalent at best and hostile at times. Working in food prep was the worst. Everything. All equipment, tools, knives were all so much harder to use. And it made it a little unsafe for me not having to reach over certain equipment to turn it off.